Malevolent Creation's first album, 1991's The Ten Commandments, was a huge album. Definitely a huge album, you can ask my mom because she still remembers about it (lol). Although I also bought their second album 1992's Retribution and their third 1993 opus Stillborn and then I forgot about them. I admit only their first album really left a great impact on me and I still like to listen to it every now and then. It's now with great pleasure that I received the promo of their new album The Will To Kill, their eighth one actually, even though I haven't heard anything from the band since their Stillborn release. First of all, I have just heard about James Murphy, THE JAMES MURPHY, laying down a couple of solos for the song Assassin Squad, which, is said, brings an old school feel to the track (James had already given this guys a hand on their Retribution album). Secondly, the band fired their mythic singer Brett Hoffman and this new album features the savage style Kyle Symons on vocals who is totally unknown to me. By the way, whereas some bands have very few line-up changes if none, this band has had ten line up changes so far since their first release. Thirdly, I just found out that guitarist Rob Barrett, who was present on Cannibal Corpse's The Bleeding and Vile albums which remain my two favorite Cannibal Corpse albums, is back with the band. All this adds up to a potentially good quality album. In fact, it was a great pleasure to listen to this new album. Malevolent Creation has definitely returned with a great opus, but doing the same style of destructive, ripping death-metal with easily recognizable riffs than they did 10 years ago. Solid razor-sharp infectious riffs, relentless pieces of very fast, old school death metal, outstanding and concise guitar attacks followed by heavy grooving parts, great melodic lead guitar work, above average songwriting, and the intensity that too many recent death metal albums lack. 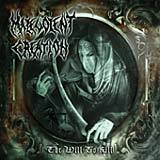 Malevolent Creation definitely stays true to their old school death metal roots and continues to deliver brutality the only way they know how to. The music does not vary much in tempo and style however and remains dominated by fast paced old school metal riffing for the most part but within some songs there are parts where the tempo does drop a little bit and honestly all this results in a very good album. The new singer performs his duties well with his brand of intense vocals and sick assaults. James Murphy's solos on Assassin Squad are very Obituary flavored and recognizable. This guy provides extreme driving metal feeling and I can't wait for his homecoming in the metal world. Despite all I have said above, I don't know if it's me or what, but I still find their first album The Ten Commandments to be their very best work to date. In fact, very few recent death-metal albums procure in me the same intense feeling that the old classic did at the time I was into the death metal scene. Anyway, it's an album everyone into death metal must get.